How much will Jack Layton's funeral cost Canadian taxpayers? It's a question being asked by at least one, some would say crass, columnist from the Toronto Sun. In a column Tuesday, Joe Warmington asks readers to consider the potential precedent-setting cost before deeming him heartless. "We question government spending on everything from bike lanes to fighter jets. Is there a limit to our probing of how public funds are spent?" he wrote. "Layton was a good man but up until now Canada did not have state funerals for Opposition leaders. Would this funeral have been paid for by the taxpayers had it been a separatist as Opposition leader like Lucien Bouchard? "Nobody questioned how and where to earmark Canada's money more than Layton." On Tuesday, The Globe and Mail reported Layton had hoped his funeral would be a public "celebration of life," quoting senior Layton aide Kathleen Monk as saying the funeral should be "used as an opportunity to build the movement, inspire people to work for change and create a better Canada." If Stephen Harper hadn't offered the Layton family a state funeral, he would have faced a significant public outcry. Barbara Kay, of the National Post, draws a link between Layton's death and the death of Princess Diana, where Queen Elizabeth was chastized for the Royal family's "coolness". "(Harper) pre-empted condemnation of his aloofness detachment from human emotion by ordering a state funeral in order to satisfy the teddy-bear grief needs of a nation," she wrote. 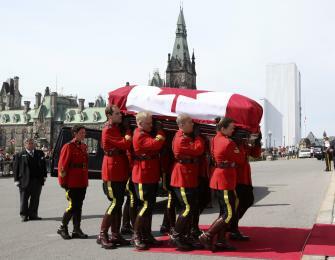 As part of the pomp and circumstance of the state funeral, Layton's casket arrived on Parliament Hill Wednesday with the carillon bells tolling 15 times. When it departs on Thursday, it will be hailed by a 15-gun salute. Traditionally, state funerals are offered to prime ministers, governor generals and current members of Cabinet. Unlike a usual state funeral, in which the deceased would lie in the Hall of Honour, Layton's body is in the foyer of the House of Commons. In terms of cost, Sun Media librarian Katherine Webb-Nelson found former prime minister Pierre Elliot Trudeau's state funeral in 2000 came in at $665,455. "Trudeau was prime minister for 15 years and a legend on the political landscape," added Warmington in a comment about the cost. "Does an Opposition leader of just months deserve the same treatment?" Only taxpayers can answer that question.